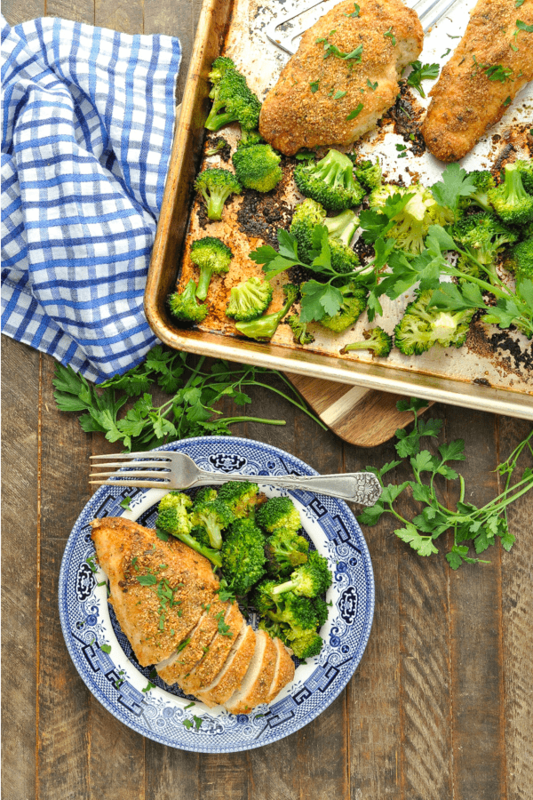 Just 10 minutes of prep and one tray necessary for this Sheet Pan Dinner: Garlic Parmesan Chicken and Broccoli! 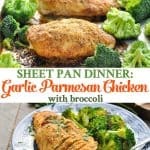 Just 10 minutes of prep and one tray necessary for this Sheet Pan Dinner: Garlic Parmesan Chicken and Broccoli! 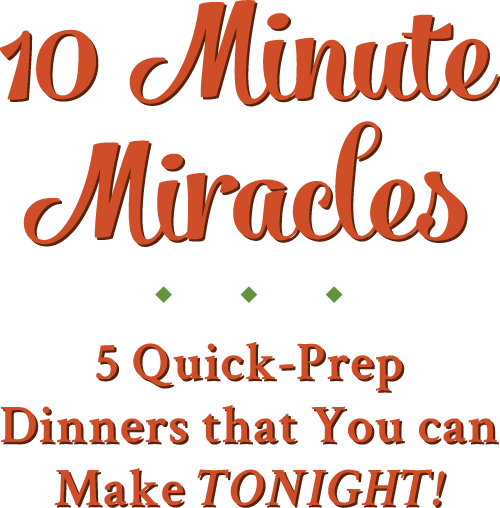 We love easy dinner recipes that don’t require much cleanup at the end! 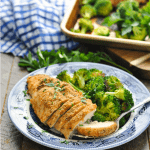 Thanks to easy dinners like this Baked Garlic Parmesan Chicken recipe, I’m not slaving over the stove to prepare an elaborate meal, I’m not worrying about what side dish I’m going to serve, and I’m not making any last-minute runs to the grocery store. Instead, I can prepare the entire recipe in 10 minutes, cook it all on one tray, and then not think about it again until dinner is ready! First, combine “Italian Style” seasoned breadcrumbs with grated Parmesan cheese and garlic powder. In a separate bowl, melt 1 stick of butter. and coat with the breadcrumb mixture. 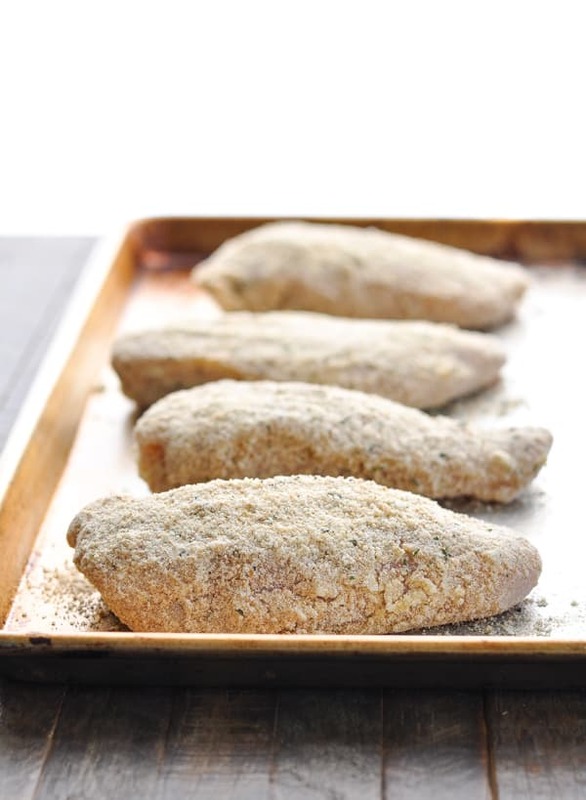 Place the breaded chicken on a rimmed baking sheet, and repeat with the remaining meat. Bake the chicken for about 25 minutes in a 400-degree F oven. 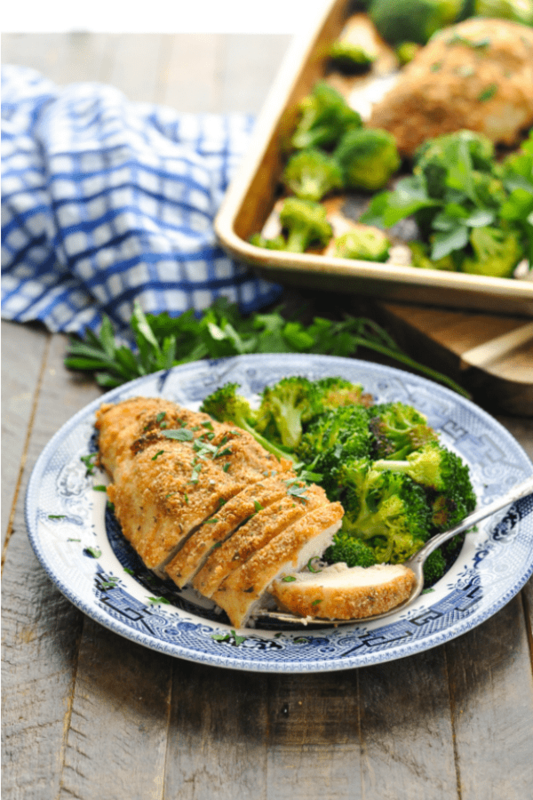 While the Parmesan crusted chicken bakes, toss the broccoli florets with olive oil, salt and pepper. 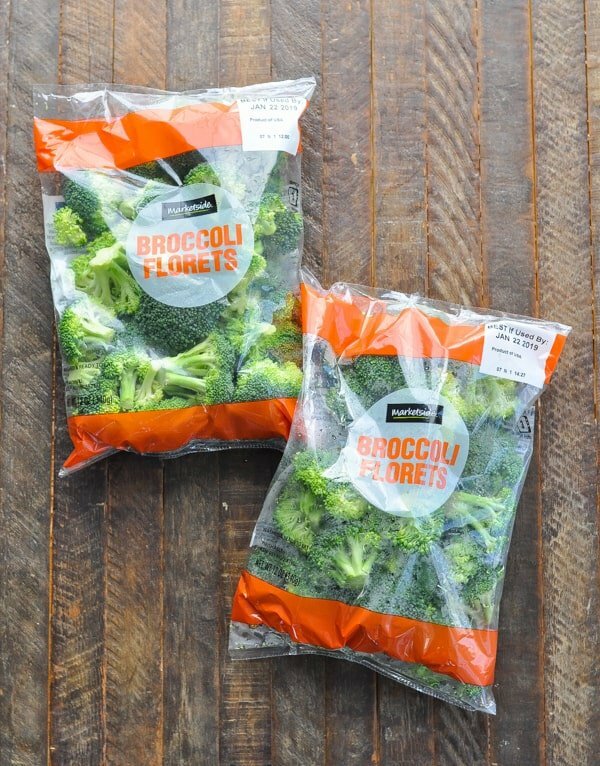 I like to use two of these bags of pre-washed and chopped broccoli florets for a shortcut, but you can certainly chop up your own head of broccoli if you prefer. After 25 minutes, remove the chicken from the oven, and add the broccoli to the pan. Place the entire tray back in the oven for about 10-15 more minutes (or until the broccoli is tender and the chicken reaches an internal temperature of 165 degrees F). What goes with Garlic Parmesan Chicken? How do you make chicken Parmesan crispy? For an extra crispy finish, try placing the baking sheet under the broiler for the final few minutes of baking time. 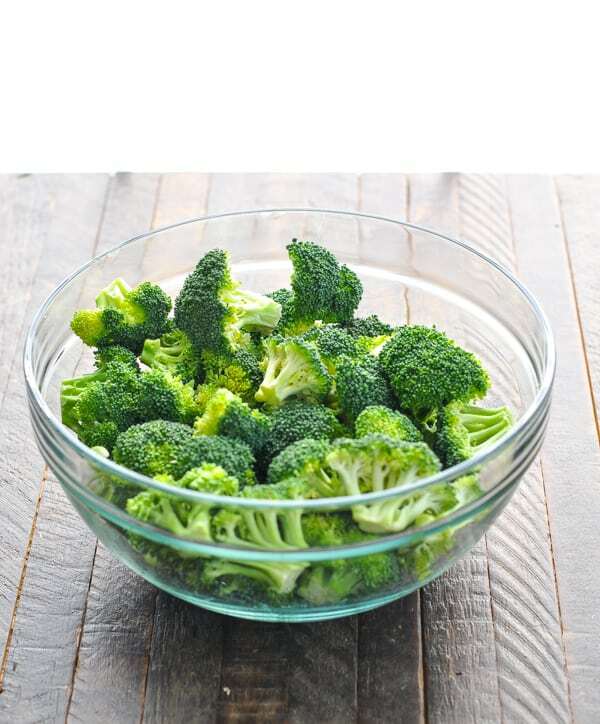 For more flavor, try adding garlic, parsley, basil, Italian seasoning, or other spices to the broccoli before roasting. For crispier roasted broccoli, add the broccoli to the sheet pan after just 20 minutes of baking time. This will give the broccoli about 15-20 minutes in the oven, which will yield a more charred vegetable. 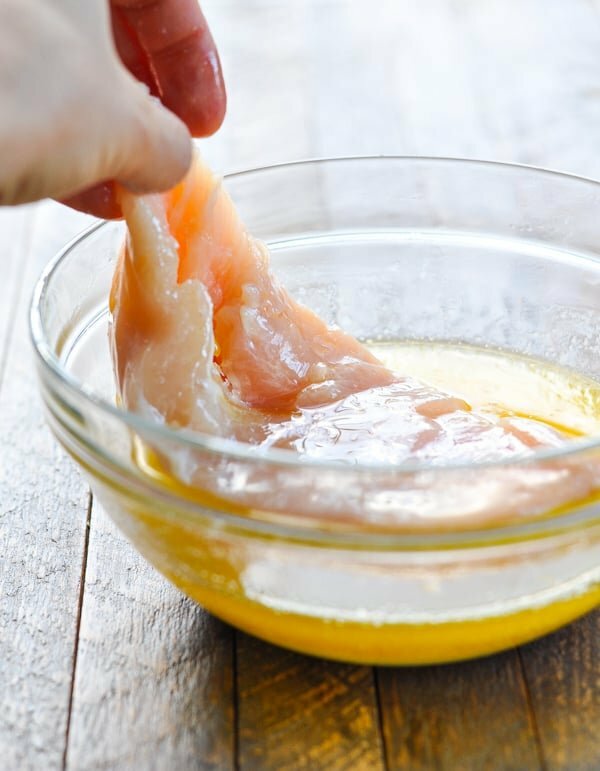 Total cooking time for your chicken will depend on the size and thickness of your chicken breast. I recommend using a meat thermometer to know exactly when your meat is done and needs to be removed from the pan. Make Panko Parmesan Chicken by substituting Panko breadcrumbs for the regular fine breadcrumbs. 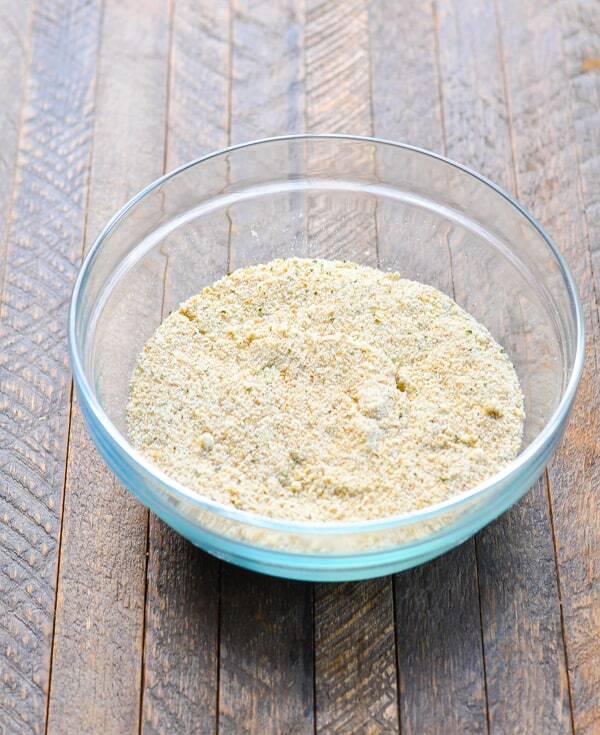 If using plain Panko, be sure to add some Italian seasoning to the breadcrumbs for that added flavor. Try this Baked Parmesan Crusted Chicken using different types of chicken. For instance, instead of the chicken breast, make Garlic Parmesan Chicken Tenders or Garlic Parmesan Chicken Thighs. If using tenders, bake at 400 degrees F for 20-25 minutes total. If using boneless, skinless thighs, bake at 400 degrees F for 35-40 minutes total. 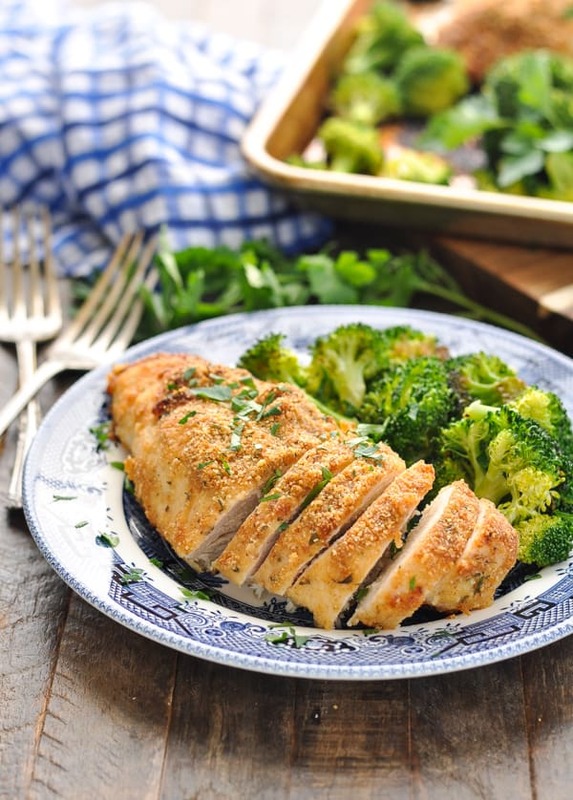 This baked Garlic Parmesan Chicken and Broccoli is a 10-Minute Miracle Meal that will add freedom to your day and give you a few moments of HAPPY. Preheat oven to 400 degrees F. Line a large, rimmed baking sheet with foil and spray with cooking spray. 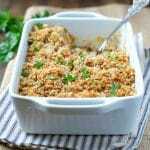 In a shallow bowl, stir together breadcrumbs, Parmesan, and garlic powder. Melt butter in a separate bowl. 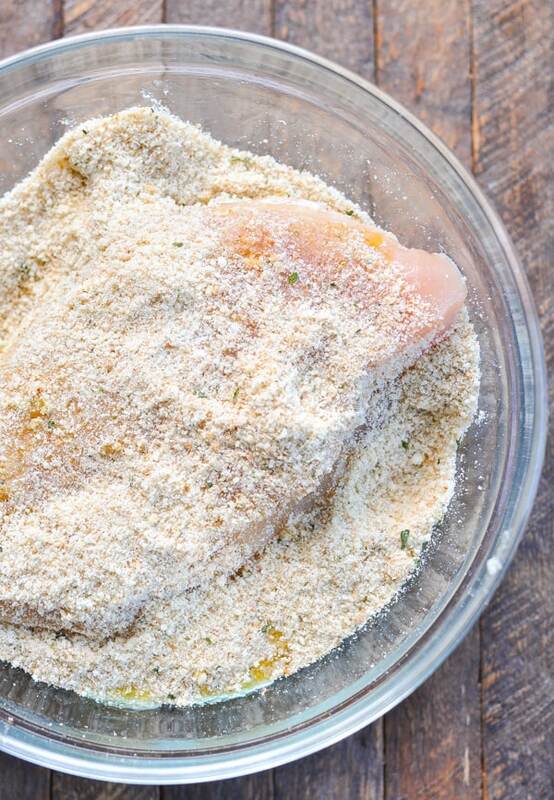 One at a time, dip a chicken breast in the butter and then dredge the chicken breast in the breadcrumb mixture. Place the chicken on the prepared baking sheet. Repeat with remaining chicken. Bake for 25 minutes, or until chicken is almost cooked through and crust is golden brown. While the chicken is in the oven, toss broccoli florets with olive oil and season with salt and pepper. Set aside. 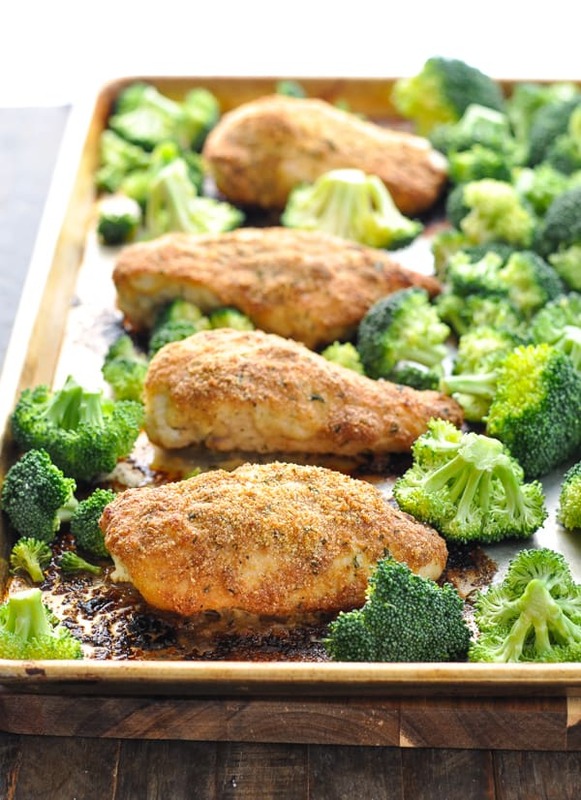 Add the broccoli to the sheet pan in a single layer around the chicken. 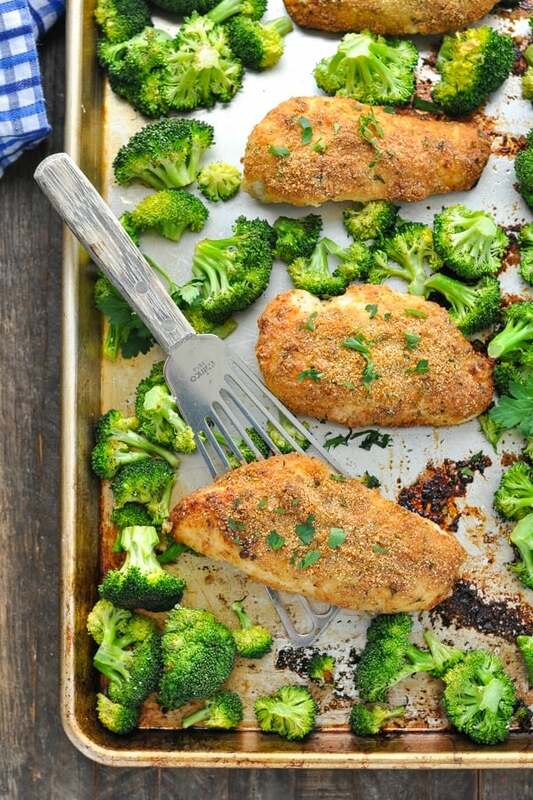 Return the pan to the oven and bake for about 10-15 more minutes, or just until the broccoli is tender and the chicken reaches an internal temperature of 165 degrees F.
Nutrition information is purely an estimate, assuming 1 tablespoon of butter, 2 tablespoons of breadcrumbs, and 2 tablespoons of Parmesan per chicken breast. Exact nutrition facts will vary depending on how much breading actually sticks to your chicken. This post was originally published in November, 2016. It was updated in February, 2019. 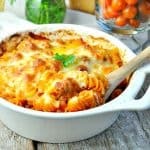 I am all about simple meals and this one looks perfect! 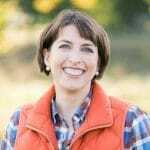 “Adding joy to our life doesn’t have to be a big event or a significant commitment” << I couldn't agree with that more as that's exactly how I feel! I am always finding joy in the little things as whilst the big things are lovely, you miss out on so much if you live from moment to moment! 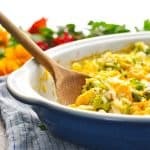 What kind of parmesan cheese should I use for this recipe? Does the kind in the green can work or does it need to be freshly grated? Hi, Rashida! You can use the Parmesan cheese in the green can! If you have freshly grated, that’s fine too — but it’s not necessary! 🙂 Enjoy! Thank you. I’m excited to try this tonight and add it to my meal prep rotation. 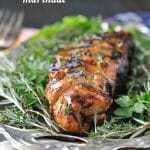 I love simple and healthy dinners like this, this looks so delicious! Should the broccoli be thawed? This recipe sounds delish & easy. I will be making it this week. Thank you again for your fantastic ideas! I enjoy reading about your family and love the pictures! Your boys are so cute! Have a great week, I will be looking forward for your next post! 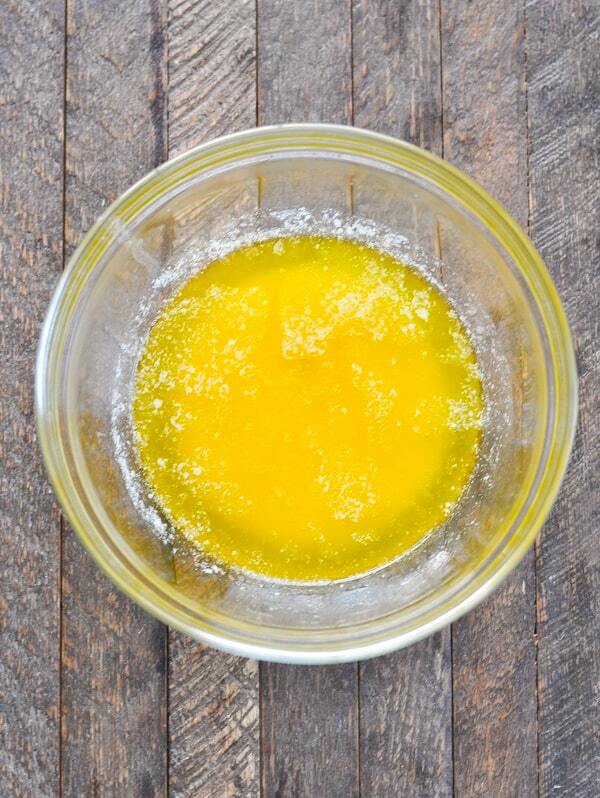 Can I substitute an egg for the butter for a healthier option? Hi, Neeraj! You can certainly give that a try. The flavor will be slightly different, and the texture will be different as well. Let me know if you think it works well!